J Exp Clin Cancer Res, 2017, 36(1):23. Purmorphamine purchased from Selleck. Sci Rep, 2017, 7(1):1899. Purmorphamine purchased from Selleck. Western blot analysis of lung CSC markers. Data are expressed as mean ± SD of three independent experiments. * P < 0.05, ** P < 0.01 compared with control group. # P < 0.05 compared with 20-μM curcumin group. Phytother Res, 2017, 31(4):680-688. Purmorphamine purchased from Selleck. In the thalamus, the expression of NR2B was significantly decreased after PUR administration, which the lowest level was detected on day 14. Moreover, the expression of GABAA‐α1 was significantly increased after PUR administration, which the highest level was detected on day 1 (*P < 0.05, **P < 0.01 vs. CCI + V rats). IUBMB Life, 2018, 70(2):143-152. Purmorphamine purchased from Selleck. (C) mRNA levels of Nek2A in purmorphamine treated H4 cells. Total mRNA was extracted and quantified by real-time PCR. Error bars represent the standard deviation of three independent experiments. **P<0.01 compared with the control groups. 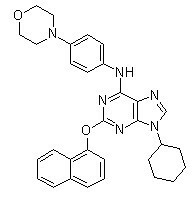 Int J Oncol, 2016, doi: 10.3892/ijo.2016.3819. . Purmorphamine purchased from Selleck. Smo binding assays are conducted with BODIPY-cyclopamine and Smo-overexpressing cells as previously described4,5, using CMV promoter-based, SV40 origin-containing expression constructs for Smo-Myc3, the deletion mutant SmoCRD (deletion of amino acids 68 to 182), and SmoCT (deletion of amino acids 556 to 793). HEK 293T cells are grown on poly-D-lysine-treated glass coverslips in 12-well plates until 70% confluency and then transfected with the appropriate expression construct (0.5 g/well) using FuGene 6 according the manufacturer's protocols. Two days after transfection, the HEK 293T cells are incubated with DMEM containing 0.5% bovine calf serum, 5 nM BODIPY-cyclopamine, and varying concentrations of Purmorphamine (0, 1.5, or 5 M) (1 mL/well) for 1 h at 37 ℃. The Smo-overexpressing cells are then washed with 1 × PBS buffer (1 mL/well), mounted with DAPI-containing medium, and visualized using a Leica DM4500B fluorescence microscope. For binding assays using fixed cells, the Smo-overexpressing HEK 293T cells are fixed with 3% paraformaldehyde in 1 × PBS buffer for 10 min at room temperature (1 mL/well), treated with 1 × PBS containing 10 mM glycine and 0.2% sodium azide for 5 min (1 mL/well), washed with 1 × PBS buffer (1 mL/well), and treated with the Purmorphamine-containing media described above for 4 h at room temperature. Method: C3H10T1/2 cells are expanded in T175 flasks; cells at 13th passage are detached by trypsin/EDTA and diluted in the growth media. The resulting cell suspension is then plated into black clear bottom 384-well plates with 2500 cells/well in 100 µL growth medium using a Multi-dropTM liquid delivery system. After overnight incubation, cells attached to the bottom of the wells. A stock solution of each Purmorphamine in DMSO (500 nL) is delivered into corresponding well using a Mini TrakTM multiposition dispenser system to make a final concentration of 5μM of Purmorphamine. Cells are then incubated at 37 ℃ with 5% CO2 in air atmosphere. After 4 days, the medium is removed and 10 μL of passive lysis buffer is added into each well. After 5 min, 10 μL of alkaline phosphatase substrate solution is added to each well. After incubating 15 min at room temperature, the plates are read on an Acquest high-throughput plate reader following the manufacturer's protocol. Sinha S, et al. Nat Chem Biol, 2006, 2(1), 29-30. Wu X, et al. J Am Chem Soc, 2002, 124(49), 14520-14521. Wu X, et al. Chem Biol, 2004, 11(9), 1229-1238. 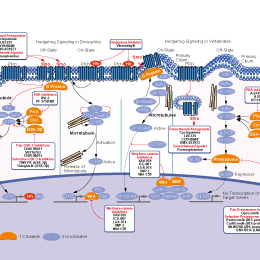 Faghihi F, Biomed Pharmacother, 2012, 3322(12).